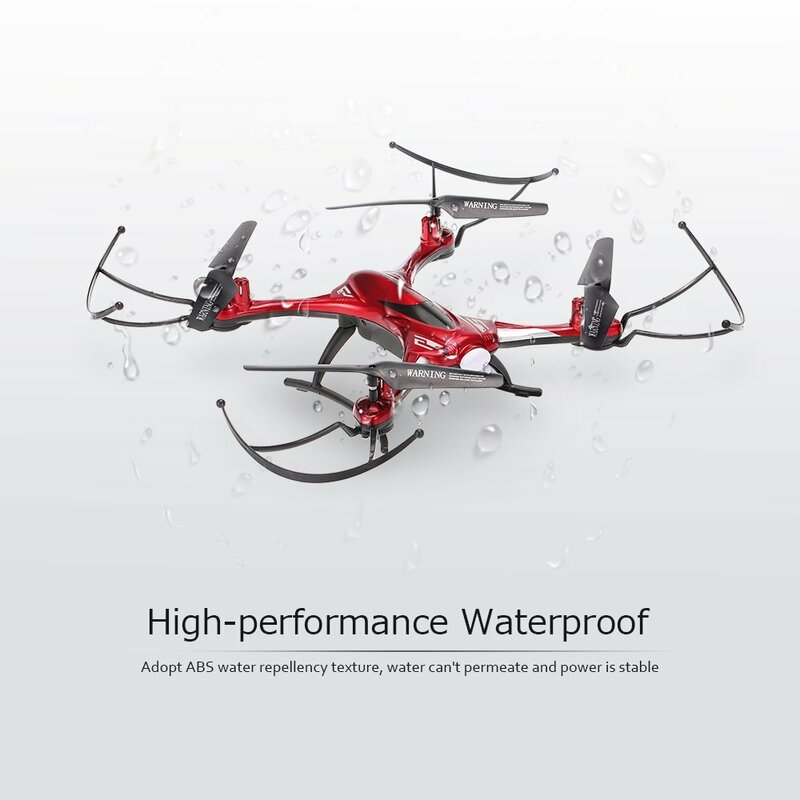 The brand new Ryze Tello is a $99 toy drone, which comes after a collaboration between Ryze, Intel and DJI, and although you can’t expect to see the same performance as the bigger quadcopters that DJI is known for, for example, it actually has a few tricks up its sleeve which make it a very, very interesting drone to review to say the least. 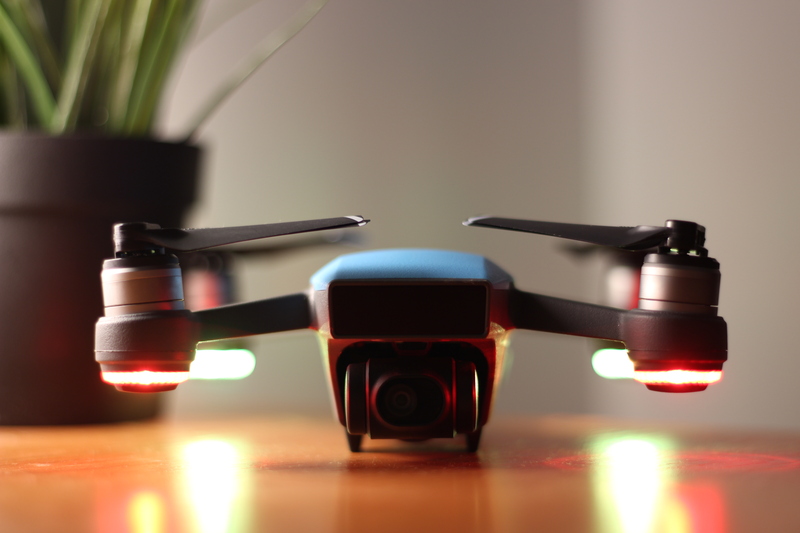 The first thing you’ll notice right after unboxing this drone is that it really is super tiny. The main body of the drone is as big as a matchbox, and the propellers are the size of a toothpick. 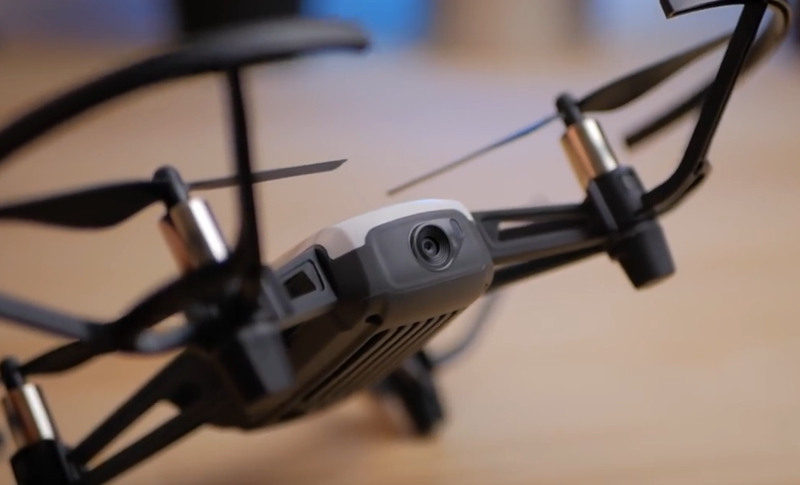 However, because the drone comes with pre-installed prop guards, it actually doesn’t seem that much smaller than the DJI Spark, for example. But take those off and you’ll immediately see how small this drone is. The drone itself has brushed motors and weighs 80 grams with the battery installed and the prop guards, so there’s no need to register it if you’re flying it in the USA. On the front you can see the camera of the Tello, which is capable of taking both photos and videos, in 5mp or 720p, respectively. You also can use the built-in image stabilisation, which is digital, not mechanical. So there’s no gimbal and you can’t tilt the camera up/down, but i’ll have to say the stabilisation is quite good for a drone under $100. On the back there’s the battery tray which holds the battery. It gives you a flight time of about 13 minutes, but during my tests i’ve had a real flight time of about 11 minutes, which is still a very good result for a drone of this size. It’s almost as good as the DJI Spark, which holds a much bigger battery. 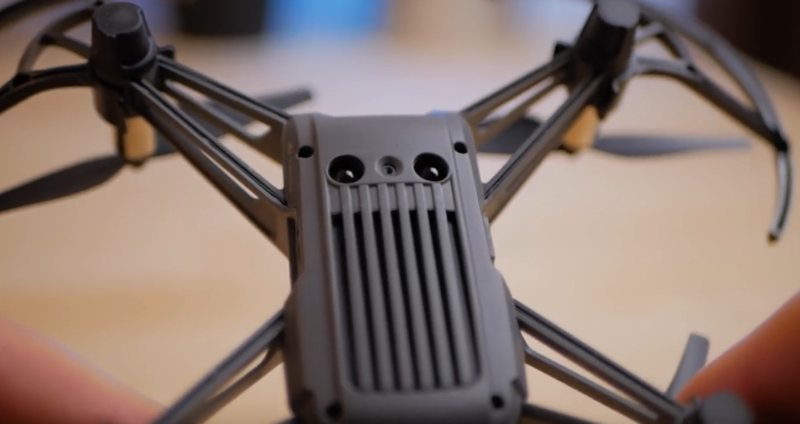 On the bottom of the drone you can see the two visual positioning sensors, which help the drone stay stable in the air and maintain its altitude. This is probably my favourite feature of this drone, as it’s surprisingly stable when flying indoors and it hovers in one place just as good as the DJI drones which use GPS. So that’s definitely a great feature of the drone, and none of the other toy drones i’ve tested until now have been that stable. And finally, on the right side of the drone there’s the power button for turning it on and off, and on the left there’s the micro sd port for charging. Surprisingly, you don’t get a charging cable in the box so make sure you have one around when you decide to charge the drone. The Tello uses WiFi to connect to your smartphone and doesn’t use an SD card, it saves all of your photos and videos straight to your phone. 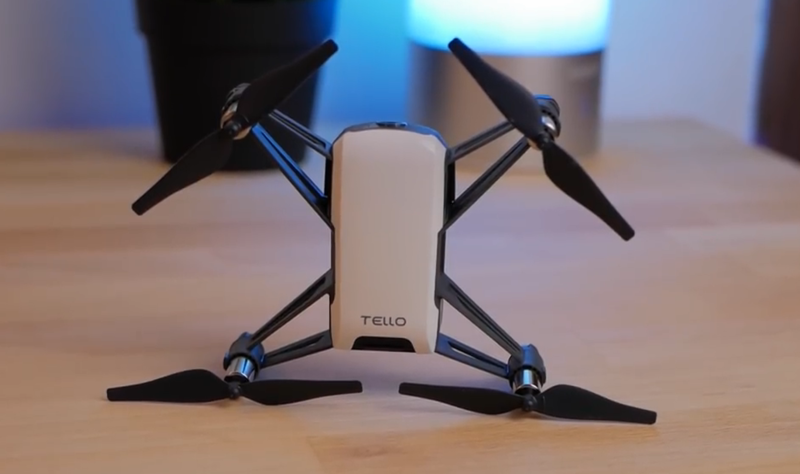 It uses the “Tello” app, which is quite well-made, and I particularly like the help menu which is quite straightforward and shows you how exactly you can connect to your Tello drone. 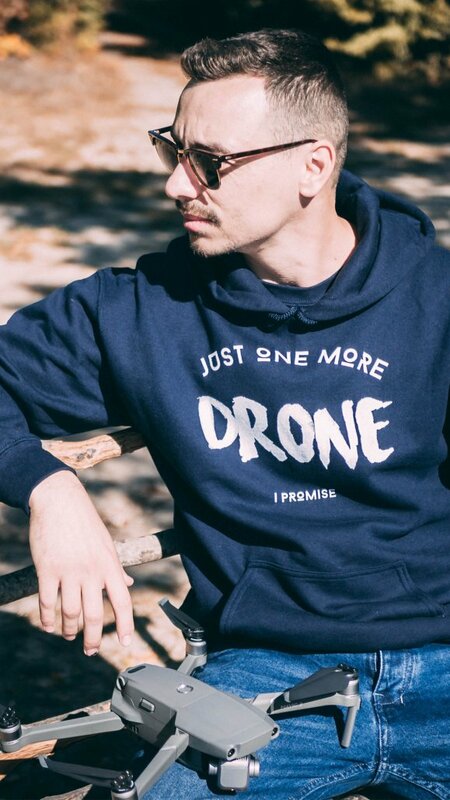 To do that, you simply need to power on the drone and connect to its WIFI network, then start the app. Once you’re in the app, you have plenty of different settings to choose – you can set the flight speed to “slow” or “fast”, and the difference it quite significant. You can also setup VR if you have one of those virtual reality headsets. So like I mentioned earlier, by default you use your smartphone to control the Tello. You can however use an external bluetooth controller if you prefer to fly it with a controller, but you have to buy it yourself, as it doesn’t come as standard. That being said, I’ve found the smartphone controls surprisingly smooth and quick, so i don’t plan to invest in a controller for now, i’ve actually had good impressions of flying it with just my phone. 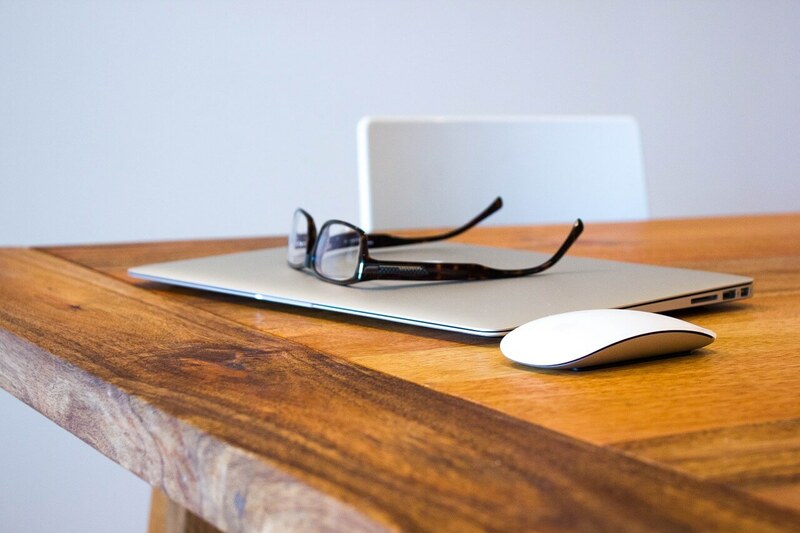 You can also change the WiFi network and setup a password – by default the wifi network is open so you don’t need to enter a password. 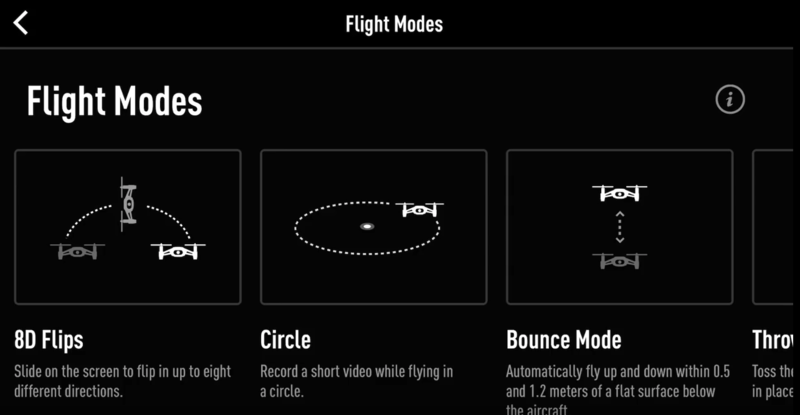 From the settings you can access the “Beginner guide”, which explains all the features and buttons in the app, as well as all of the flight modes. It really is quite useful and handy. 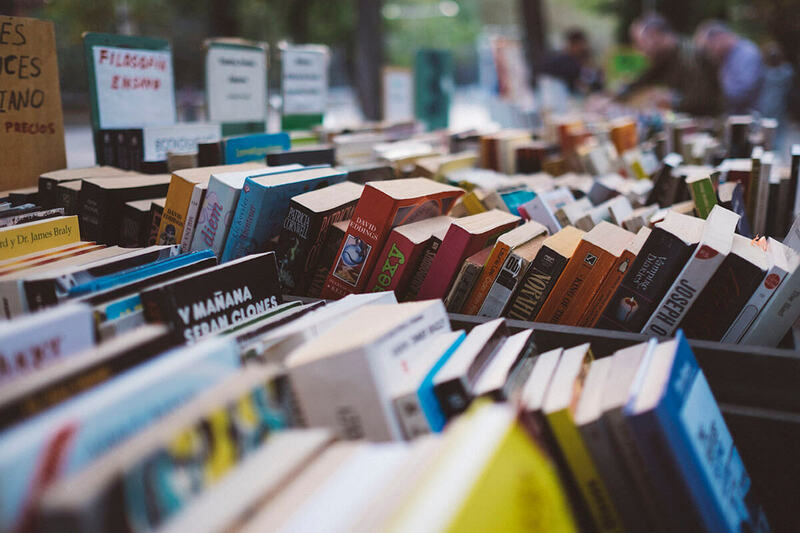 You can also switch the measurement system between metric and imperial, set the photo quality to “normal” or “high” – I suggest you set it to high, it makes a difference! You can also change the low battery warning percentage, and if you’re flying indoors i suggest to set it to 10%, so you can have more flight time and once you hear the beep you can get ready to land. In the second tab of the settings you can see the status of your sensors and the current version of the software. 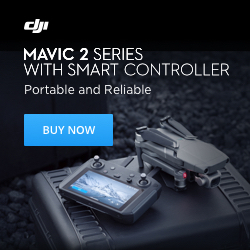 This is also where you can calibrate the sensors and update your latest firmware, which I suggest you do first thing before flying, as Ryze have been pushing out updates to clear some minor bugs, so if you want to avoid problems, I suggest to always update to the latest firmware. You can access the 6 different flight modes in the Tello by tapping on the drone icon in the top left corner of the app. First off, we have 8D Flips – this mode allows you to slide on your screen in order to flip the drone in eight different directions. I really like the flips and i think they’re cool, especially if you have never flown a drone that can flip. I also really like how stable the drone is right after finishing that flip, so one more major plus for having those VPS sensors on the bottom of the drone. 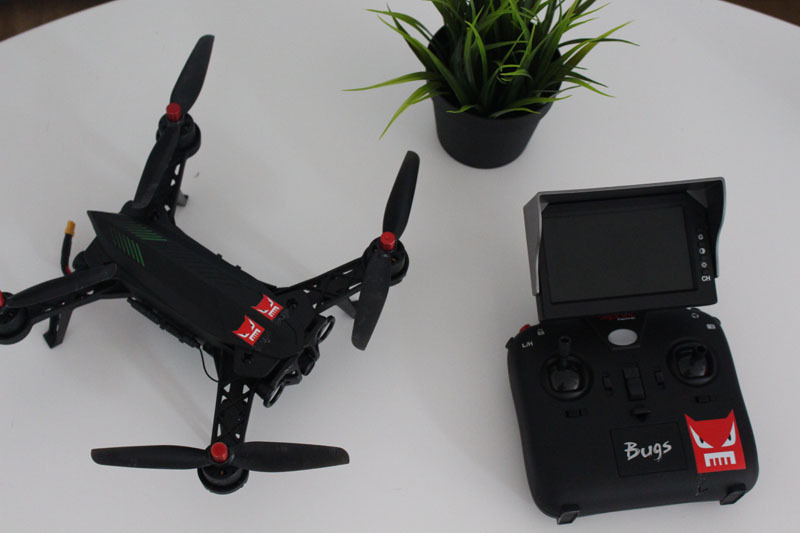 Next, we have “Bounce mode”, which i don’t really see the purpose for – when activated, the drone will automatically fly up and down within around 1 meter height and it will continuously bounce like this. The next flight mode is “Throw and Go”, which allows you to too the aircraft in the air and it will hover in place, waiting for your next command. I like this feature, and it’s very easy to use, definitely great for the beginners! Next up, we have what Ryze describes as “EZ shots” – those are the same thing as the “Quickshots” from DJI drones – those are basically automated flight sequences which help you capture footage automatically. 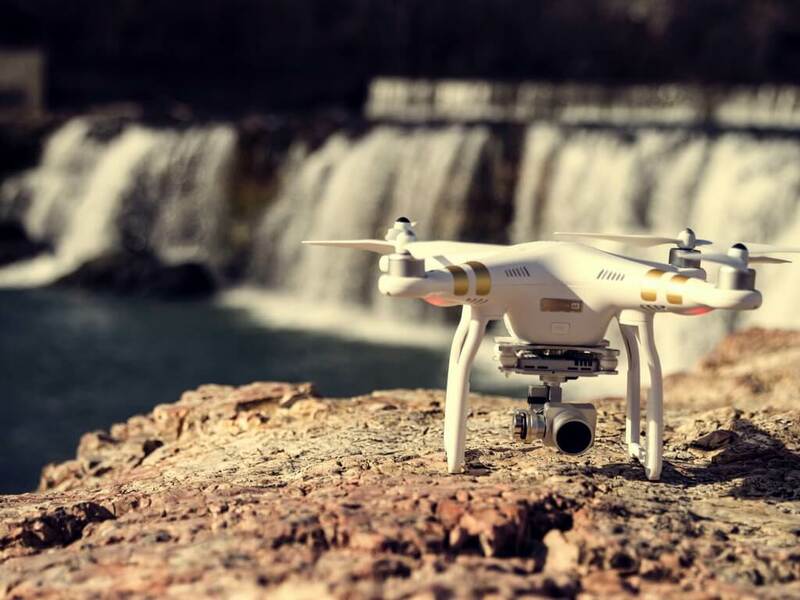 “Up & Away” records a short video while flying upward and backward, just like the “Dronie” quickshot from the DJI Spark and the DJI Mavic Air. “360” records a short video while spinning 360 degrees in place. It’s a cool mode to show off your location or maybe the people around you, if you’re in a family gathering for example. “Circle” records a short video while flying in a circle. 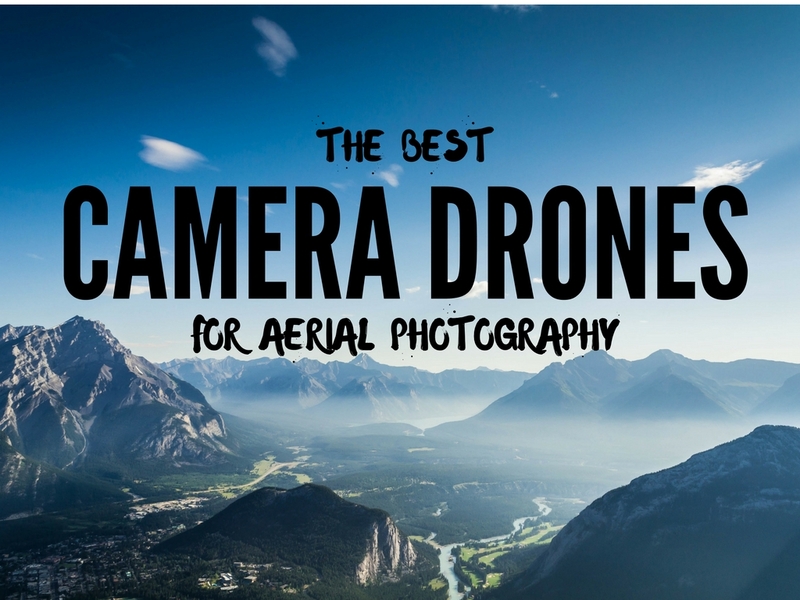 Finally, i want to talk about what i think is the best thing about this drone, and what I think most people are not that familiar with when it comes to the Ryze Tello – and that’s the fact that this drone is completely programmable! 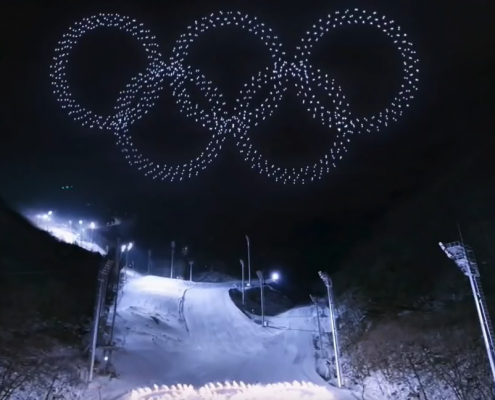 So similarly to the opening of the olympic games where we saw hundreds of drone doing automated sequences and creating a light show, the Ryze Tello can also be programmed to follow a set of commands via a very simple and easy to use software. 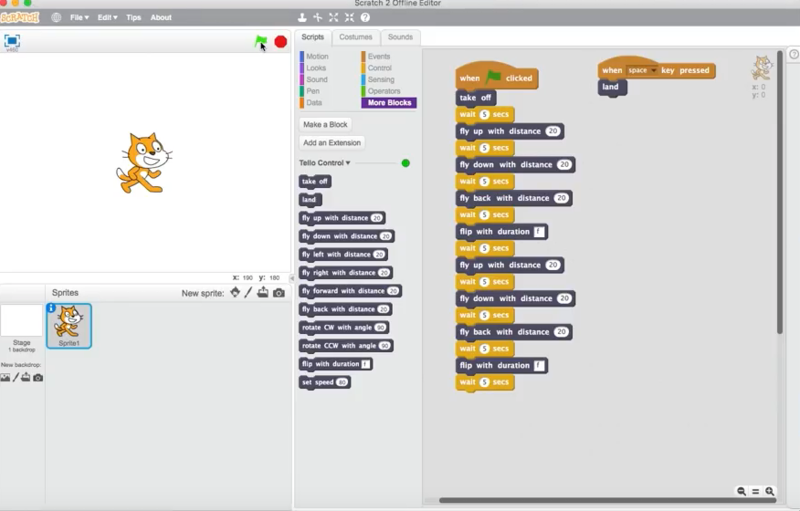 You can use a free software for your PC or Mac called Scratch, or also a free iOS app called DroneBlocks – they both allow you to build a set of commands, which will be automatically executed by the drone when you start the sequence. I have a list of commands that will be executed when I press the start button in the Scatch software, and there are tons of features which you can play with! Similarly, if I want to use my phone, it’s just as easy, if not easier – I simply need to build the blocks of commands which I want the drone to perform, hit “start” and it will automatically start performing them and land afterwards. This really opens up a whole new world and it’s especially helpful for people to understand how programming works in a simple and fun way. So that’s definitely something that you can use together with your child and have some great experience together. 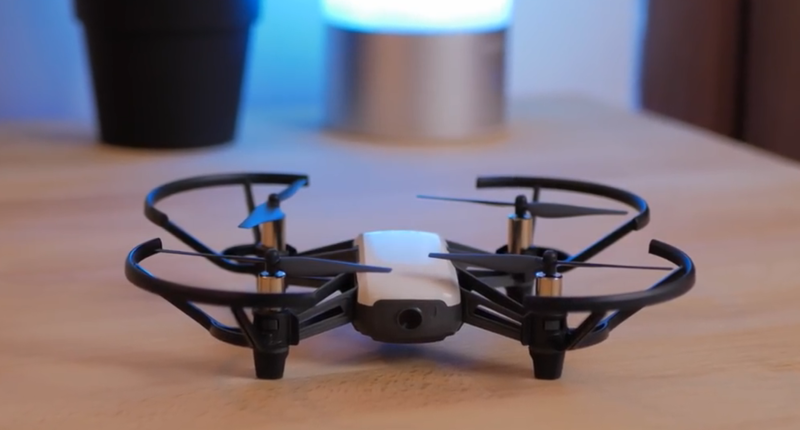 So all of those features are available in the Ryze Tello, and in my opinion make it the go-to drone when it comes to toy drones, regardless if you’re buying it for yourself as your first ever drone or for your child if you want to hook him or her to the hobby. 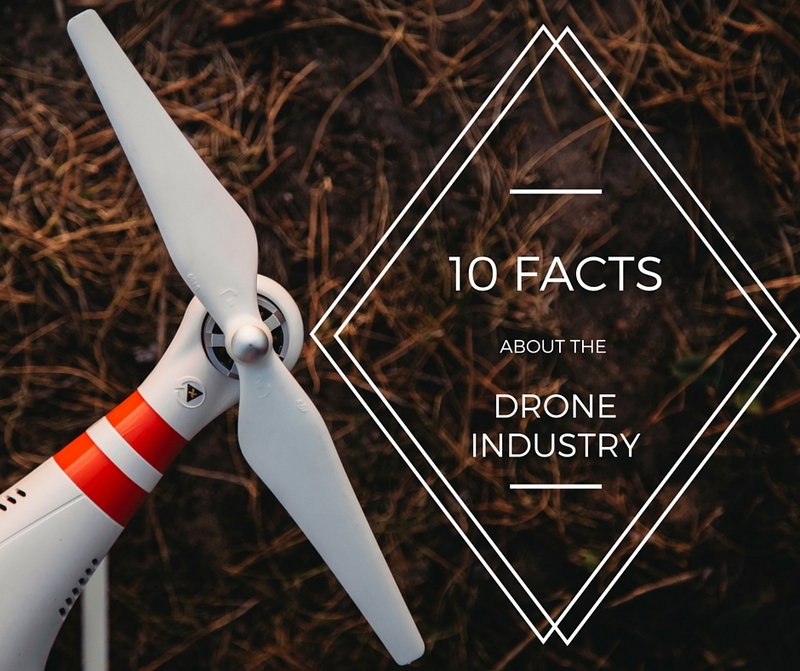 It’s a great product and something that i think will change the overall drone scene when it comes to affordable toy-grade drones. 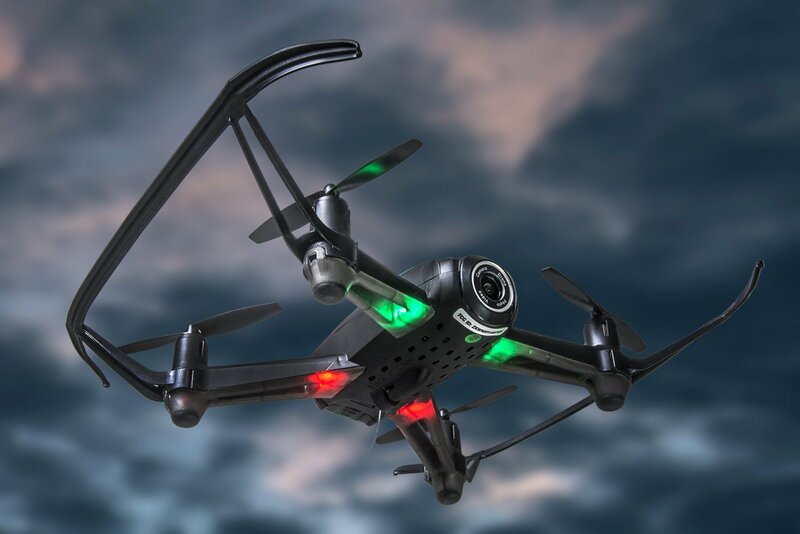 Again, i have a couple of toy drones that are all around the $100 mark but they have nothing on the Tello when it comes to stability, smoothness and features.